Byrne Robotics: "What a piece of junk!" Topic: "What a piece of junk!" When you first saw the Millennium Falcon in STAR WARS, did you really think she was a piece of junk or did you just take Luke's opinion as reasonable? 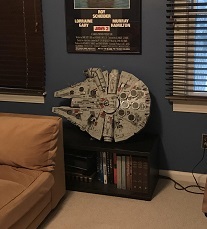 Somewhat related, has anyone bought and assembled the large-size Lego Millennium Falcon set? Also, somewhat related, did anyone purchase the Master Replica Millennium Falcon prop from about 10 years ago? How well as it held up? The Millennium Falcon was meant to look cool to us viewers. Luke's exclamation was a way to signal to the audience, though, that in the world of Star Wars, it was looked upon as an old junker. Luke's exclamation is one of the most brilliant parts of the original movie. The audience gets a beat to go WOW!! and then...! As to your question about the models, I have both, and they're doing fine. matte paintings on the falcon. in that? You`re braver than i thought`? Yup. The Falcon was indeed a "piece of junk" to anyone who knew what they were seeing. That was part of the fun. It was perfect, in the original. This little tiny motley crew flying on in a piece of junk -- and they free the friggin' Galaxy! I learned the no wiki rule ... sorry for the miss-step. >> Somewhat related, has anyone bought and assembled the large-size Lego Millennium Falcon set? I have -- spent the better part of a week putting it together over the holidays. Fatigue set in during a couple of repetitive spots, but for the most part it was great fun. And I love the look of the finished product (though it still amazes me how massive it is). It's really something to see the most recent Lego Millennium Falcon fully assembled. It's BIG.